On Mar. 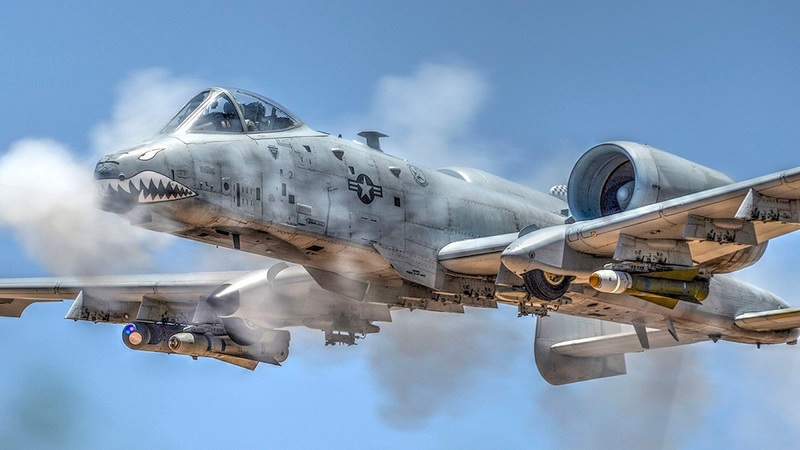 2, 2018 two A-10C Thunderbolt II pilots received Distinguished Flying Cross (DFC) medals during a ceremony held at Davis-Monthan Air Force Base (AFB). Gen. Mike Holmes, commander of Air Combat Command (ACC), presented Maj. Tyler Schultz and Capt. Samantha Harvey, 354th Fighter Squadron pilots, with the aviation decorations for their heroic actions in support of U.S. Army forces near al-Shaddadi, Syria, on May 2, 2017. As explained by Airman 1st Class Giovanni Sims, 355th Fighter Wing Public Affairs, in the article D-M Airmen receive Distinguished Flying Cross, the DFC is awarded to any officer or enlisted person of the U.S. Armed Forces who has distinguished themselves in combat in support of operations by heroism or extraordinary achievement in flight. Schultz and Harvey displayed superior flight leadership and exemplary Airmanship while engaging fighters from the Islamic State in Iraq and Syria during a close air support (CAS) mission in support of Operation Inherent Resolve (OIR). When a U.S. joint terminal attack controller (JTAC) reported that his team was surrounded and under intense direct fire, Schultz and Harvey immediately located the friendly forces and began to assess the enemy’s coordinated attack. 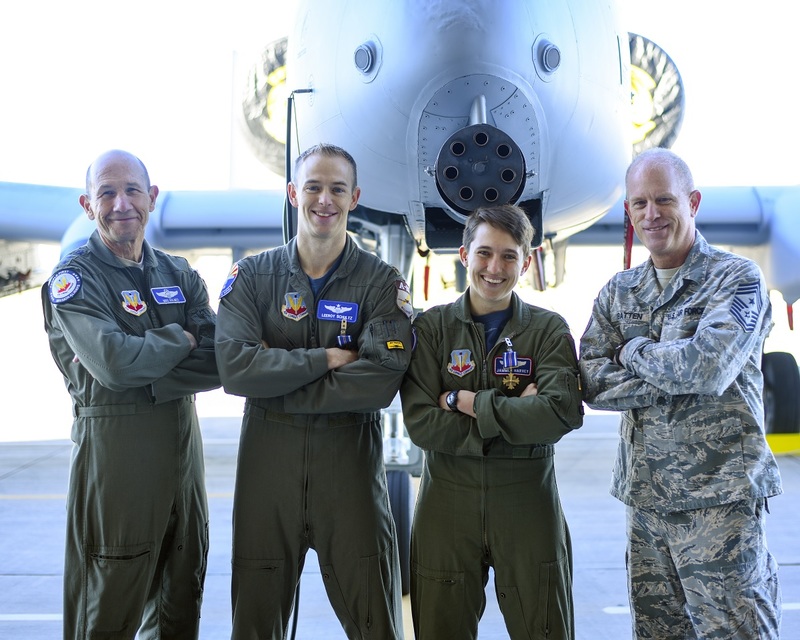 U.S. Air Force Gen. Mike Holmes, commander of Air Combat Command, Maj. Tyler Schultz and Capt. Samantha Harvey, 354th Fighter Squadron A-10C Thunderbolt II pilots, and Chief Master Sgt. Frank Batten III, command chief of ACC, pose for a photo at Davis-Monthan Air Force Base, Ariz., March 2, 2018. General Holmes presented Schultz and Harvey with the Distinguished Flying Cross for their heroic actions in support of U.S. Army forces near al-Shaddadi, Syria, on May 2, 2017. Noteworthy Schultz and Harvey are not the only Hog drivers who recently earned an award for their excellent flying skills. On Mar. 3, 2017 in fact Maj. Brett DeVries, an A-10 pilot with the 107th Fighter Squadron has been awarded Joe Foss Award for Excellence. During a strafing run in the A-10 while flying over the Grayling Air Gunnery Range in northern Michigan on Jul. 20, 2017, the cannon jammed which caused the canopy to jettison in mid-air. Compounding the issue, the attack jet’s landing gear was locked in the up position and most of the radio systems were knocked offline. Despite the difficulties, DeVries was able to recover the aircraft to land at Alpena Combat Readiness Training Center with minimal damage to the plane. The aircraft’s tires, which are partially exposed on an A-10 to allow for a wheels-up landing, blew out on touchdown. DeVries was able to maintain partial control of the aircraft. No one was injured in the emergency and the aircraft suffered only minimal damage.